Guerrilla artist Banksy has covertly cemented a 20-foot (6-metre) satirical statue protesting at the British legal system into a central London square. Banksy, best-known for sneaking his work into the Tate, has depicted the figure of justice as a prostitute with leather boots and a thong. Several hundred fans gathered at Clerkenwell Green on Wednesday to see the bronze statue being unveiled. It was put in place at 0200 BST (0100 GMT) on Wednesday without permission. Banksy, who shrouds his work in secrecy, has gained a reputation for subversive stunts that outfox authorities. He says the statue cost £22,000 to construct, is made of solid bronze and weighs three-and-a-half tonnes (3,500kg). It shows the figure of justice - whose statue overlooks the Old Bailey in London - with US dollar bills stuffed into her garter and a plaque on the plinth saying: "Trust no-one." "This is a brand new monument for London," Banksy wrote in a statement read out by rapper MC Dynamite. "It is a monument dedicated to thugs, to thieves, to bullies, to liars, to the corrupt, the arrogant and the stupid." He said the stunt was timed to coincide with the first anniversary of the death of Kevin Callan, the lorry driver who was the victim of a miscarriage of justice when he was convicted in 1991 for the murder of a four-year-old child. His conviction was overturned in 1995. 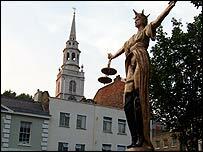 "It's the most honest depiction of British justice currently on display in the capital," Banksy said. "I hope it stays there for good. "We are learning that the people we trust with our liberty cannot be trusted." The location, an ancient green just outside the City of London, was chosen because it was the site of Banksy's last arrest. In April, Banksy exhibited a dead rat wearing sunglasses in the Natural History Museum for several hours before museum staff noticed. Six months earlier, he had surreptitiously hung a painting in the Tate Britain gallery, and is also known for creating the sleeve for Blur's Think Tank album. In 2003, an exhibition in which he spray-painted graffiti on cows, sheep and pigs, was closed after the animals became "hot and distressed". He painted the Queen as a chimpanzee during her Golden Jubilee and sprayed "Mind the crap" on the steps of the Tate Britain before the Turner Prize ceremony.